It’s official: the deep Amazonas is more remote than Siberia. In all of the visits I have made to provinces of the Congregation of Jesus (CJ) all over the world, never have I been without a signal for my BlackBerry…until I visited one of our sisters living and working in a community along the Amazon. This was just one extraordinary revelation among many from my visitation to the Brazilian province in February and March 2014. What follows is an account of part of that trip, two weeks during which I and Elena, one of the General Assistants, covered an enormous amount of Brazil visiting the CJ sisters at work in the furthest corners of the country. The pace of our travelling was hardly leisurely, as you will gather, but the remoteness of the locations meant that this was the time required to see all of our sisters at work – Brazil is very, very big indeed! All of the communities we visited in these two weeks are in places in which the majority, if not all, of the people are poor, and our sisters work with them both in a catechetical and a pastoral role, in collaboration with the local parish priest where possible. Parishes in rural Brazil are huge and can be made up of a number – anything between 20 and 40 – of smaller communities, some in the town in which the parish is located and the majority in the ‘interior’ hinterland to that parish. These interior communities might see their priest anything from once a month (unusual) to once a year, depending on the size of the parish, the number of such communities, the distances involved – and the difficulties of transport, which are not to be underestimated! Our first of many journeys during this fortnight was by no means the most complicated, but it still involved a one-hour flight from Sao Paolo to Belo Horizonte, a four-hour wait there prior to a three-hour flight to Altamira, capital of Pará state, and then an hour’s drive to our community in Vitoria do Xingu. In the Vitoria region of Pará, which is in the west of the country, there has been much deforestation by the locals to create pasture for their very few livestock, but there are also large farms which have been appropriated illegally and the people turfed off what little land they had. The usual social problems abound, including high birth rates (usually out of wedlock) and much abuse of alcohol (particularly beer) and drugs. Although there are three schools, and most people do go to school, prospects are slight: unemployment, especially among the young, is very high. But somehow the people seem very cheerful and the younger women in particular take great care to look good – nail polish, gleaming hair, good clothes. In Xingu there are two CJ sisters, and their main work is in the catechesis of young people and visiting in the ‘communities’. As I have now so often experienced, in the pastoral missions that are parish–based, there are tensions between the parish priest and the sisters, which means that although the sisters do wonderful work in a difficult situation, a lot of their potential is wasted. We left Xingu after 48 hours to head further west to Amazonas state via a visit to the Bishop of Altamira, a very fine Austrian missionary – Erwin Krautler - who has been in Brazil for almost 50 years, over 30 of which as a bishop. He is outspoken in his defence of the indigenous people against the depredations of the government (in terms of land grabs) and against the nearby hydroelectric power station and its consequences, both ecological and social, for the area. His speaking of the truth to power over the years means that he now has 24-hour security, paid for, interestingly, by the state government. All we spoke to described him as a ‘prophet’. We felt very privileged to meet him. We flew from Altamira to Manaus, the capital of Amazonas, by far the biggest state in Brazil. Manaus is a curious mix of the old and seedy (think Graham Greene) and the new and shiny, but is clearly a city on the up. It has a wonderful late 19th century theatre – the Teatro di Amazonas – built shortly after Brazil became a monarchy and designed to showcase Manaus as a centre of culture and civilization. It also has a thriving port, from which we began the next stage of our journey, by boat, at 5am. We took a seven-hour trip on the ‘fast’ boat, via a town on the river called Codajas, to the tiny community of Murituba, where one of our sisters lives and works. Murituba is one of the string of tiny communities along the Amazon which are only accessible from the river, a fact which completely governs the lives of those who live there: the river is an artery which provides the lifeblood of the Amazonas communities. When the river rises, as it does inexorably during the rainy season, it eventually reaches the communities, so all the houses are built on stilts; and during the months when the water has overrun the river banks (it does so by five to six metres, on average) people get around by boat. That includes going to the local shop, to school and to church, even next door! The pace of life in Murituba is slow. For a start, it is too hot to do anything much in the heat of the day (35-38°C) so people just sit around and talk, which is what we did with some of the people from the community who came to see us. Murituba is an outpost of the Codajas parish, and sizeable enough to warrant having a sister there to support the community in between the three-monthly visits of the parish priest. He came with us for our visit, which meant that the community had Mass that evening. Mass is always at about 7.30pm, when the sun has gone down, but before that we walked through the community and chatted with the people. Families here are large and extended, and people are very poor. The imbalance between the numbers of men and women was marked: many of the men leave to find work in cities in Amazonas or further afield. The community has very few facilities – no mobile signal (as I discovered! ), no internet (except in the school, which is locked outside school hours) and just one public phone for the whole community. However, what almost every house has, in common with even the poorest places that we saw, is a huge satellite dish, and the television seems to accompany every activity up to and including sleeping. About 60 people attended Mass and we were dive-bombed throughout by all kinds of large insects as well as swarms of mosquitoes. Mass in Brazil in general is an experience; music and singing are central and the enthusiasm is palpable: the reading of the gospel is always followed by a round of lively applause, at least outside the cities. That said, all the priests we spoke to were clear that the people can be fairly eclectic in their religious experience and do a fair bit of ‘shopping around’. Murituba is a classic example of the widespread growth in Brazil of the evangelical churches. It has approximately 1000 people and three other denominations as well as the Catholic Church. These denominations flourish because they provide a pastor who is there all the time, whereas the Catholic priest is only there occasionally. That said, apparently the Baptist pastor has upped sticks and left since the arrival of our sister there as a consistent, Catholic pastoral presence. The following morning we returned to Codajas on the parish boat. This boat is fitted up so that it can be lived on for anything up to a week or ten days: it is the only way that the priest can reach the remote communities of his extended parish. He has a couple who accompany him, the man to look after the boat and his wife to cook and ‘keep house’ on the boat. It seems to work pretty well. So, back in Codajas for lunch and later that afternoon we boarded another boat back to Manaus. We arrived at 5am the following morning, after a 13-hour journey in fairly unpleasant conditions, but not without witnessing at one point the most stupendous rainbow from one side of the river to the other – never did it seem more the sign of the covenant of which God spoke to Noah, as we saw it in what must be one of the most unspoilt places on earth. That afternoon we flew to Brasilia and then from Brasilia on to Teresina, the capital of Piauí state. 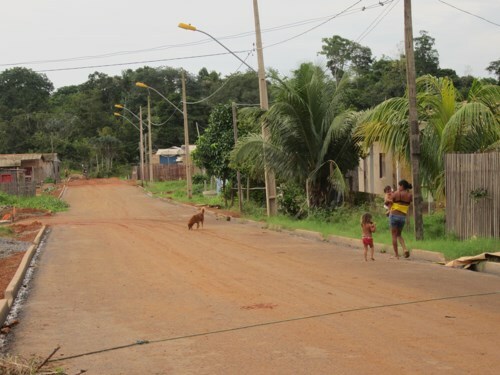 Piauí, in the centre-east, is a very poor, undeveloped, agricultural state, red in soil (as is all of Brazil that we saw) and generally unremarkable. As in the Amazonas, the houses are small – typically one storey with only a couple of rooms – but they differ in that they mostly have red, terracotta-type tiles (as opposed to corrugated iron) which, together with the red soil, create a distinctive impression. Most people live off the land as far as they can and the roads appear to act more as conduits for flocks of goats and herds of donkeys and cattle than for motor vehicles. It was quite possible to go for half an hour without seeing another vehicle, much like the Australian Outback, to which it bore quite a resemblance. After spending the night in the seminary in Teresina, we left the following morning for our community in Paes Landim, a small town with a sizeable Catholic church and Catholic community, as well as three other denominations and a large non-church-going population. Our two young sisters there are an exemplar of the kind of ministry carried out by CJ sisters in all of these remote parish communities: they support the team of catechists; one works every morning in the parish secretariat; and the other runs a women’s adult literacy class three mornings a week and a monthly programme for children under-6 from the parish and the outlying communities, which includes weighing, provision of supplements for those who are malnourished and generally supporting the mothers. They are both involved in general parish support such as preparation of the liturgy. On Mondays there is a big market in the town and they hold an ‘open house’ for any Catholics who come in from the interior and just want to come and chat or seek advice. They also continue a project which has been going for fourteen years, having been founded by the CJ not long after our sisters first arrived there: next door to our community house, the parish bought what amounts to a large kitchen garden and this is divided into plots. A group of ten women are part of a self-help project which involves growing and then selling their own vegetables. They then keep all of the income other than what they invest in seeds for the following year. It is small but seems to work very well – one woman has been doing it for ten years. The sisters also run what is called the ‘youth pastoral’, in which they work with and train young people aged 14-23 either as catechists or leaders in the Church: that group has grown from 8 to 50 members in the past two years. As part of this, on two mornings a week Sister Eliana does a one-hour broadcast on the town radio, together with some of the young people. From Paes Landim we moved on to Sao Jão do Piauí – mercifully only an hour’s drive away – where we spent Shrove Tuesday. Judging from the festivities that we saw, Sao Jão has little to learn from Rio when it comes to celebrating Carnival – even the advent of Ash Wednesday did not diminish the party spirit in the town until 5.00am! However, there were still plenty of people at the 9.00am Mass on Ash Wednesday. A member of the parish there gave a presentation about all that our sisters have done in this parish since we first went there in the 1980s when there was no parish priest: pretty much everything involved in parish life, short of saying Mass! The community of three now works in collaboration with the parish priest and, because of their own ages, they tend to work more with the programme for older people, the sick and in two of the nearby poor communities. The next leg of our journey involved a seven-hour car ride back to the airport in Teresina, arriving in time to check in for our 4.00am flight, via Sao Paolo, to Belo Horizonte in Minas Gerais state and, from there, another seven-hour car journey through a very different landscape – wave after wave of rolling, tree-covered hills. Our destination was another small community outside a big town – Braunas – where three of our sisters animate the local Catholic community and the priest comes once a month for Mass. On our first evening there was a very well-attended holy hour and the following morning there was a Mass in the community chapel for about twenty local ‘Friends of Mary Ward’ – principally women – who are clearly devoted both to Mary Ward and to the community. At the end of Mass, they sang a specially-written hymn to Mary Ward, which all knew by heart. I found this incredibly moving – these people, in a place that Mary Ward would never even have heard of, are so inspired by her in the living out of their day-to-day lives. They meet once a month and clearly value the opportunity both to learn more about Mary Ward and to pray together. The CJ community here are, again, older (two in their 80s and one in her 70s) so there is a question about sustainability (a question that hovers over all the missions of the very over-extended Brazilian province) but for now they punch considerably above their weight in terms of keeping the local Church alive and well in a place where the vast majority are poor and the social problems are rife. Our last marathon journey was to Paraná, in the south of the country and adjacent to both Argentina and Paraguay. Here, we visited two communities, one founded in 1971 and one only in 2011. Both are in small towns – Santa Maria d’Oeste and Perola d’Oeste – and the work of the members follows the usual pattern in these places: training of catechists and other leaders in the community, pastoral work with younger and older people, etc. In Santa Maria we met another very active Friends of Mary Ward group who were vocal in their appreciation of the community of three, one of whom had been a founding member of the community over 40 years ago and whose return last year was clearly a great joy for the people. The return to Sao Paolo from Paraná marked the end of our major excursions; the remainder of the visitation was spent in and around the capital. By the time we left Brazil, we had travelled thousands of miles, seen 60 members of the Congregation of Jesus in thirteen communities and experienced both the country and the Brazilian Church in their richness and their poverty. We were told it would be an adventure – and indeed it was!